*We are one of the 13 City APPROVED - weekly Vacation Rentals in Seal Beach. Please book an approved home so you have a comfortable stay. The Pineapple Cottage is fully equipped and completely remodeled with all new appliances and floors. This spacious cottage has been professionally decorated with a tropical Tommy Bahama feel. The cottage is a single story, one bedroom/one bath, with two skylights to bring in the natural light. The kitchen is fully equipped, and we offer free wireless. Enjoy a good book by the fireplace or on the private rooftop deck, which offers night lighting for relaxation, or watching the sun set. The Pineapple Cottage sleeps four people. The bedroom includes a beautiful queen-sized Tommy Bahama Pineapple bed. The living room has a double fold out sofa bed and single person starfish daybed. All are beautifully furnished with an island feel to help you relax. The Pineapple Cottage is 30 steps to the Pacific Ocean's white sandy beach. We have an outdoor shower to rinse the sand off, from your day at the beach. Once you park your car for the week, you will be able to walk anywhere throughout the town in just five minutes. This is where you will find the quaint old town of Seal Beach. Main Street has many restaurants for you to enjoy or walk on the pier. Relax at the Cottage Spa or enjoy the local nursery. In the summer enjoy music @the pier. A full service Von's Pavilion grocery store with a Starbucks is close by, where you may choose to order your groceries online, and have your food delivered to your door. Seal Beach is one of the last quaint beach cities in America. Come and hear the roll of the surf and relax! Seal Beach is located just 22 miles south of Los Angeles at the Northern end of Orange County. Just 18 miles north of the John Wayne Airport. -11 miles away from Disneyland, and very close to other attractions, Aquarium of the Pacific in Long Beach, Universal Studios, and more. -Travel down Historic PCH Highway, which is minutes away from Huntington Beach, Long Beach, Newport Beach, Corona Del Mar, and Laguna Beach. -While strolling along the beach and collecting sea shells, take a look out at the Pacific Ocean where you will see an island. Now think about a day trip to the famous Catalina Island just 26.5 miles away! -Seven Blocks or a five-minute walk to Main Street with cafes and shopping, summer music in the park, and the Seal Beach Pier. -You can walk everywhere in Seal Beach! The journey to your vacation is your reward! Our first sunset when we moved back to Seal Beach. Our home is 74 years old and has been completely remodeled with care to keep the charm of the 1940's. Modern with old vintage character. *1 bed Cottage - Modern bathroom with Shower & Tub. Has skylight and window in the bathroom. Main street, for shopping and dining is a 5 min walk for the cottage. We are one home from the ocean and boardwalk, We have a **** very **** -very, tiny view of the ocean from the roof top deck. Just a quick walk to the boardwalk and the ocean is yours to see & enjoy. We are located one house behind the Boardwalk / Pacific Ocean (or) about 7 homes down Seal Way or Ocean Ave- a quick walk to the beach. We do not have a view, but you are just steps away. Each house is fully appointed for cooking needs. No Bikes, but you can rent them at Main Street Cycles - just a 5 min walk from house. This 1 bedroom cottage is exactly as advertised; it is a charming little home with a bit of everything you need. The hosts are very welcoming and we immediately felt comfortable in their abode. (Even the neighbors were friendly.) 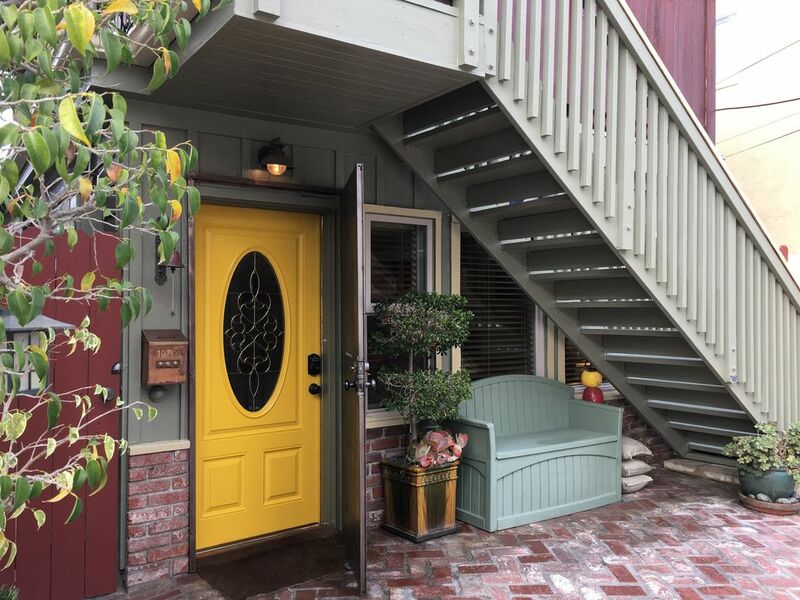 My husband & I were visiting family in Seal Beach and found this cottage a lovely place to stay. My favorite: A cup of coffee in front of the living room fireplace was the perfect way to start the day! The rooftop terrace was especially enjoyable, too. We would definitely love a return visit!! PS: We will always be ready for your next adventure. My husband and I grew up in this area and we love coming back. Elena and Kai's place was the perfect get-away. Perfect and comfortable for 2. The Pineapple Cottage has everything needed. We look forward to visiting this lovely little cottage again. Such a cute beach cottage. Just like the sign by the shower says, I found my little piece of paradise. Hope to be back soon! Very cute cottage with lots of unique pineapple décor. We had a great time and really enjoyed our stay. Elana and Kye were very accommodating and great hosts! Our family of 4 stayed here for a week. The house is a cherished destination for the owners, and it shows. We found the best perk is how close the house is to the beach and downtown seal beach. If you enjoy a leisurely stroll, I would say that a car is optional in Seal beach and at the Pineapple house. Thanks for a great trip! Seal Beach is situated perfectly between Los Angles & Orange County for day adventures up and down the coast or head to the mountains. Many vacationers know Seal Beach as the place to arrive - unload the car and just walk everywhere within minutes from our 4 Beach Cottages. * Disney Land? Many folks Uber / Lyft to save time from parking. Think of the time you will save from not having to park - taking the tram and standing in the waiting lines. You will gain one hour in time with Uber / Lyft to the park& another hour when you leave. You have been in lines all day. Now its time to go home and relax. We are very close to the LA parks and museums as well. Spend a day in LA just checking out the sights - getting lost in a cool way while LA shopping- dining or just exploring the areas. *San Diego on your list? We are about 1 1/2-hour drive. Well worth the drive. * Sports - Dodges - Angles - Lakers & Anaheim Ducks are all close sporting events from Seal Beach. All 4 Cottages are located just steps to the Pacific Ocean - take some time to just relax and put your toes in the water and then take a nap on the beach. Wake up & then walk to Main Street to eat. Come relax and make some memories. Your vacation is your journey to relaxing times at the beach. Don’t forget about the Seal Beach 10 & 5k in April/May. The Kite festival (check out the kite store on Main Street) and Free music in the park during the summer months. We look forward to seeing you soon along the Pacific Coast. (* 1 Bed Pineapple Cottage) *Rate for WINTER/SPRING is $230 a night & the SUMMERR rate is $255 a night ** 2 Bed Bungalow has a 30 day minimum. The WINTER rate is $3,900 & The SUMMER rate is $4,800 for 30 day minimum. We are approved for Vacation Rentals in Seal Beach by the City. The Pineapple Cottage is just steps to the Pacific Ocean. We offer beach toys for the kids and chairs to relax in for the adults. Please keep us posted with any special requests.